1 Smooth hubs, holes in seats on gun, long footrest and small elevator knob. 2 Ridged hubs, holes in seats on gun, short footrest and small elevator knob. 3 Ridged hubs, no holes in seats on gun, long footrest and large elevator knob. Were there two dies or a double cavity die : one with long foot rest and one with short ? These variations are easier to see on the three close-ups above. The small elevator knob is 5.5mm dia. and the large elevator knob is 8mm in diameter. These are all post war versions as they have the larger diameter axles. No 1 being the earliest, No 2 being later and No 3 being the latest. Are these the only known variations on the post-war 161b AA Guns? David,I do not agree with the order of issue on the photos above. I think that the middle photo with the short foot rest is the earliest but you may have a good reason to say that it is the second issue.Which of these three variations is the american issue with domed axles ends ? or is there a fourth variation. 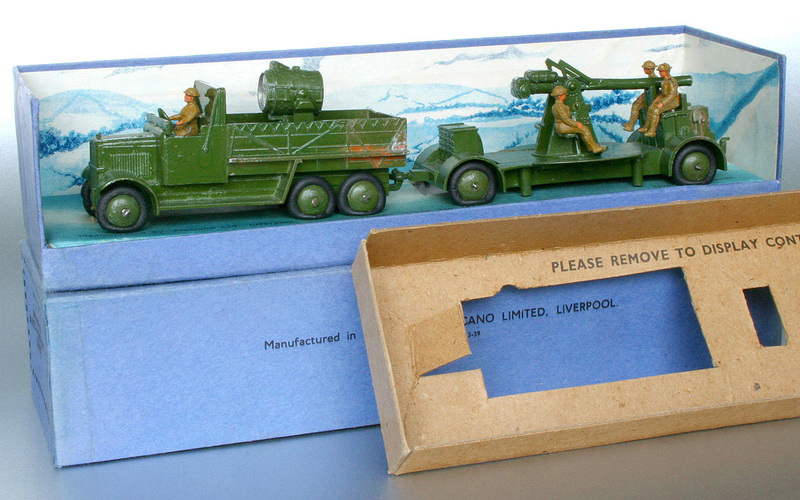 Dave--To add to your excellent discussion of the Anti-Aircraft Gun on Trailer, I am posting photos of both my pre-war version and also my original Dinky Toy, that I received here in California around 1954, which makes it an export version. After looking at your photos and the variations noted, it is interesting to note that the pre-war model also has the large footrest, holes for the soldiers, and the small knob. My export model, from around 1955, also has these same features, plus it has ridged wheels with domed axle ends. I am leaning towards thinking that the small footrest and large knob were likely a later version, unless there were two dies in use, resulting in one large and one small footrest. I can image die wear or problems could have caused that change. I agree totally with you on that Terry. Besides the holes in seats and other minor differences described above it is interesting to see different paint finishes applied to this model in the course of time. Jan----So nice to see a brownish version......I have never seen one in person before. That's a great photo, showing all of them together. I still remember playing with mine, around 1955, when I was 10. I ways always amazed by being able to raise and lower the gun barrel with that little knob, able to rotate the gun, and then those platform "skirts" that raised up and down. 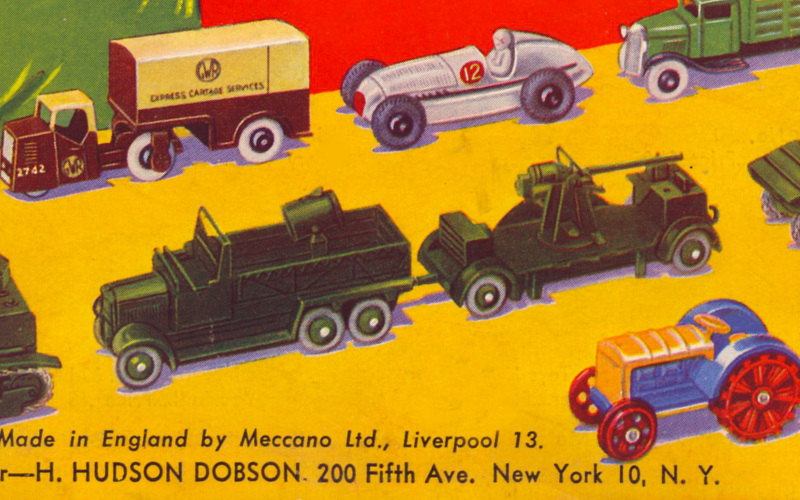 To me, it was a wonderful little toy, and so much a part of my early Dinky memories. 1. With no. 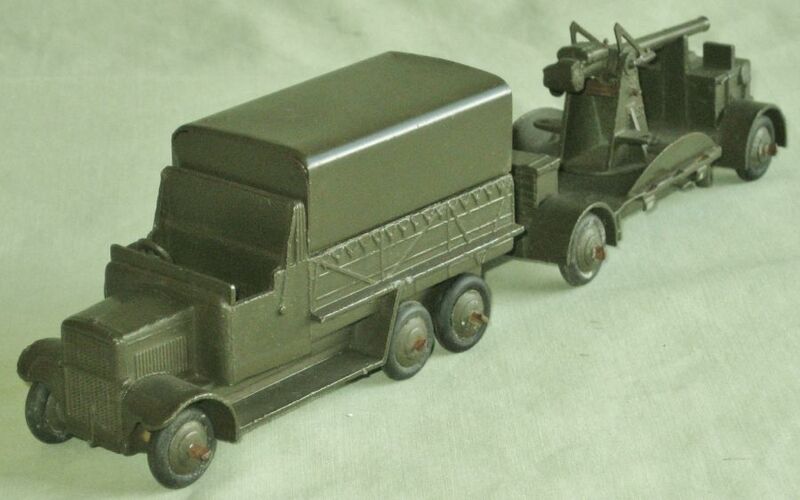 161a Searchlight Lorry in pre-war Gift Set no. 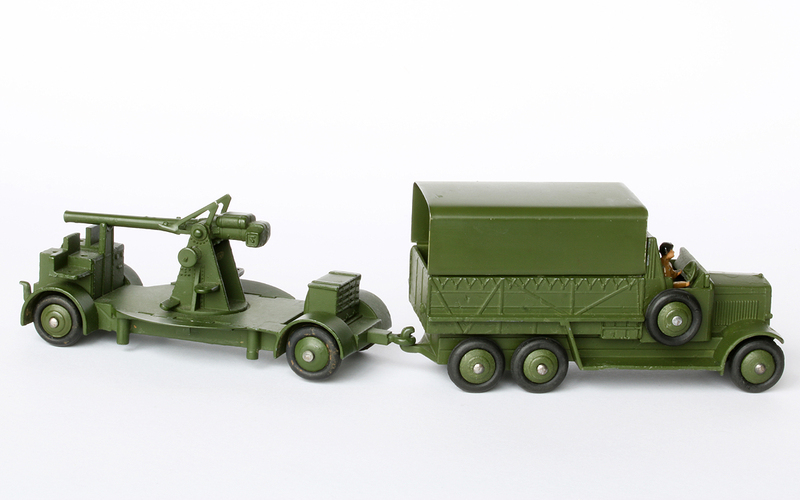 161 Mobile Anti-Aircraft Unit. 2. With early post-war no. 151b Transport Wagon, both with ridged hubs, crimped axle ends and treaded tyres, each manually marked underneath with the probable date of first acquisition: 2.11.48. 3. With final USA export no. 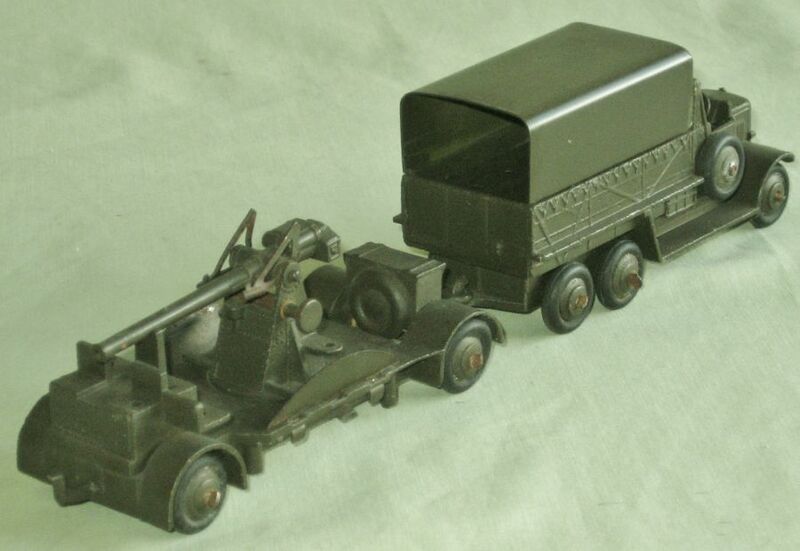 151b/620 Transport Wagon, with fixed driver, both with ridged hubs, post 1952 domed axle ends and smooth tyres. 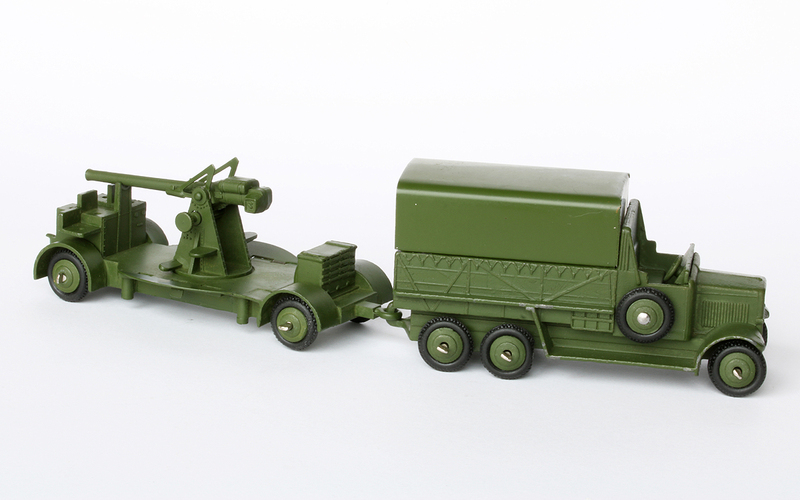 Here is my brownish-green version of the 151b Transport lorry and AA gun. In this photo is does not look much different from the normal green but when seen beside the normal one it shows more clearly. Then there is my collection of these 2 items. 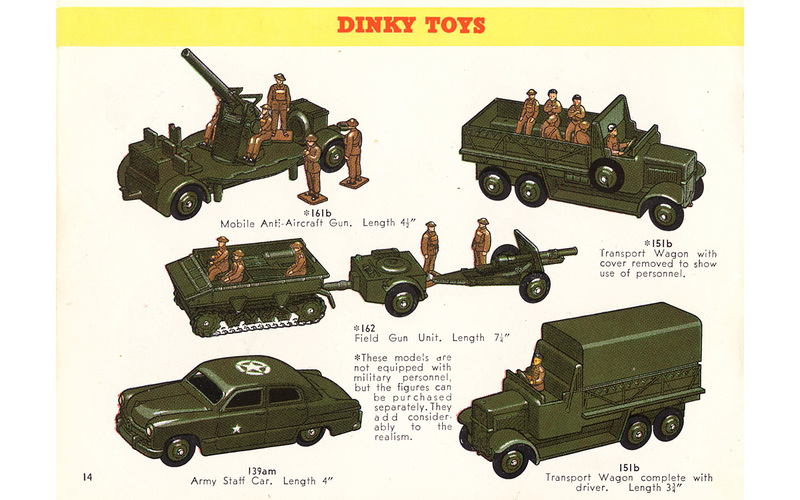 On the right is the pre-war version, then a post-war version, then the brownish-green version and on the left the later post-war version with domed axle ends.